You can go to a four-year college with less than a 3.0 GPA. There are a number of colleges that are open admissions meaning that they will admit anyone who meets their minimum standards. This can mean just having passed specific classes in high school or meet minimum scores on selected placement tests. Students with below a 3.0 GPA are also admitted to colleges without open admissions. For example, McMurry University in Abilene, Texas admitted 55% of applicants and 21% had less than a 3.0 GPA. Midwestern State University accepted 75% of students and also had 21% of its freshman with less than a 3.0 high school GPA. In some states such as Texas, students can be admitted to state public institutions without consideration of GPA. The University of Texas at El Paso has an admission’s grid based on class rank and college test scores which may account for 24% of the freshman having a GPA below 3.0. Texas A&M-Kingsville has a similar process and has 25% of those enrolling with less than a 3.0 average. Why do you have less than a 3.0 GPA? The question is should you start at a four-year institution if you have less than a 3.0 GPA. It’s basically a question of the GPA reflecting your actual work ethic and academic accomplishments in high school. If the low GPA is explained by an unusual, one-time disruption to your GPA, you may be more than ready to handle college work. 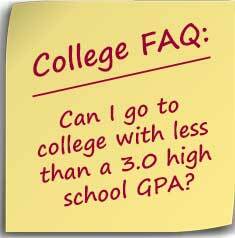 However, if the low GPA is a reflection of poor work and study habits, why do you think you’ll do any better once you start college? Despite the drawbacks in attending a community college, you may be better off testing your abilities at a community college given the higher costs of attending a four-year institution. Most community colleges cost less than state universities, have smaller classes, and will probably provide more support services. An increasing number also provide dorms and honors programs. Furthermore, considering the low graduation rates of some four-year institutions, community colleges with articulation agreements with four-year schools may be preferable approach to a four-year degree. Some states such as Virginia and California have guarantee admission agreements between their community college system and four-year institutions, including the more prestigious state universities. If nothing else, establishing a new GPA at a community college would also expand the number of four-year colleges that would accept you.